Frost Burned is book 7 in the Mercy Thompson series. I've been binge reading/listening to this series via audiobooks since last year and have to say the audiobooks make it very easy to marathon the series! This time around Mercy is dealing with the pack being abducted and she'll stop at nothing to get them back. We start off with Mercy, our coyote shifter Black Friday shopping with Jesse (her mate Adam's daughter) when they get into a car accident. Dealing with that is enough to shake a person but she quickly realizes that something is wrong with Adam and the pack and goes into investigation mode. After saving a mate of a pack member, Mercy stashes Jesse somewhere safe and goes full speed ahead. We get to see Mercy, Ben (one of the members of the pack) and a few others in action. I really enjoyed seeing Mercy not teaming up with the same people this time around. With most of the pack missing, she's forced to deal with some characters we don't really get to see very much and I was glad that they took a bigger role. This installment is full of action and we're learning more about not everyone being happy that werewolves exist. That doesn't seem to be all though, and it looks like not just the werewolves are having issues arise. 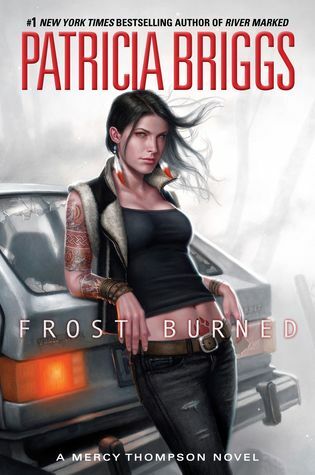 Frost Burned was an action packed novel that left me intrigued to see where the series will go next. We learned a tiny bit more about Mercy's powers, and I'm hoping we continue to find out more soon. I've had a few issues with one or two of the previous books, but was glad to see this installment was better for me. I can't wait to see what happens in the next book. If you're a fan of Urban Fantasy with werewolves, vampires, and fae you'll love this series. I love this series. I have the new one and I'm curious to read it! soon! :D I'm trying to catch up lol!! I swear, I'm going to start this series this year! Really, I'm determined, I already have the first book and it has been sitting on my shelf for far too many years, it's time!! I need to start this series but I don't have the first book yet. I noticed that it's pretty cheap on Book Depository so now I'm super tempted. I've had a few of the installments I didn't care for but overall this series is good!! I love this series so much and I'm so far behind. I cannot wait to get caught up. I know you had some problems in the past but I'm glad it seems you didn't have it here. Brilly review! Silence Fallen is awesome too! Woot! I think I'll even be able to catch up before the release :D Hope so at least! Think I just have 2 more of the books. I really loved this one too. I really like Ben, though sometimes I love to hate him. Reading his short story in Shifting Shadows really helped move him more into the like column. I did enjoy seeing a few different players in this one. Great review. oh this one sounds pretty great. I definitely need to read this series. I like that the author focused on other characters you don't see that much. I so need to get to these books. I think I would really enjoy the series and setting of them. Thank you. Oh yes, you'd love this series Melissa!